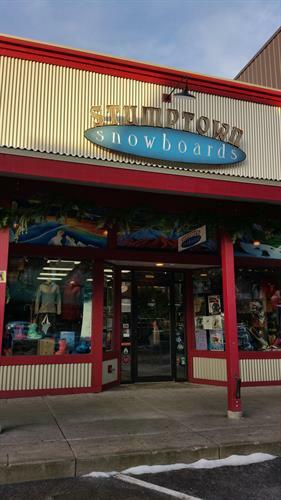 Stumptown Snowboards is your full service snowboard shop in the winter. We have two locations, one in downtown Whitefish on Central Ave and the other up at Whitefish Mountain Resort in the upper village. Our mountain location is in the Morning Eagle building, located slopeside, across from the Bierstube. Both shops offer professional ski and snowboarding tuning and repairs. Both shops offer the best equipment in the industry from companies like Lib Tech, Gnu, Never Summer, Arbor, Burton and Union. Our mountain location is the best place to get premium ski and snowboard rentals. We offer demos of just about every snowboard we sell on the floor. We want to make sure you have a great experience on the mountain! Don't forget the accessories...gloves, goggles, neck gators and helmets. In the summer Stumptown becomes an inland surf shop, minus the surf boards. We have a great selection of sunglasses from Oakley, Maui Jim, Ray-Ban and Smith. We carry women's and men's swim, clothing, sandals and footwear from Volcom, Quiksilver, Roxy, Billabong, Element, Obey, Reef, Vans, Adidas and Nike. We are your shop for any skating needs.